Global warming! Don’t you just love it! It snowed today. Being a Yorkshireman I was not going to let a bit of snow stop me from walking the cliffs on my daily walk. I don’t normally take a camera, but snow on the cliffs is unusual and was worth recording. 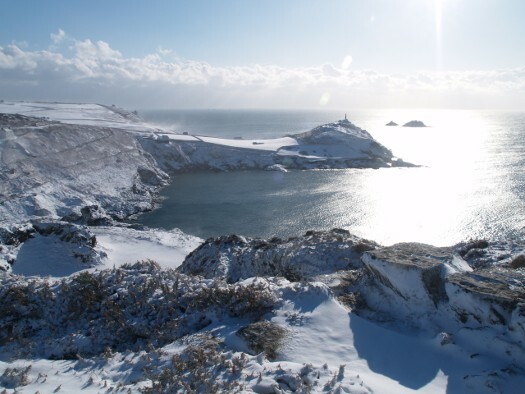 The image above shows Cape Cornwall with The Brisons (Cornish: An Gribow, meaning the reefs) beyond with the sun creating what I like to call “the Silver Sea” out into the Western Approaches.